há filosofia na Rádio Miúdos! na última semana de aulas não tivemos propriamente aulas. é verdade: final do 1º período, cansaço acumulado (da minha parte e dos pimpolhos) e toda uma energia canalizada para as férias e para as coisas mais natalícias. houve dias em que o são pedro colaborou com bom tempo e acabámos por ir para o recreio brincar. levei alguns jogos (de mímica, eles adoraram) e combinámos que cada um poderia fazer aquilo que quisesse. houve quem jogasse à bola, quem apanhasse folhas caídas no chão, quem quisesse desenhar no caderno da filosofia... cada um podia escolher o que queria fazer. nos dias em que o são pedro não colaborou - afinal, estamos em dezembro... é natural que haja frio e chuva! - ficámos na sala e as regras do tempo livre continuaram: podem fazer o que quiser, agradecendo que não corram nem joguem à bola. inventámos jogos, desenhámos, fizemos colagens. dentro daquele espaço que é a sala de aula, imperou a liberdade e a autonomia. e eu brinquei com eles. a dada altura, o R. vem ter comigo e diz-me: "obrigada, joana, por nos teres dado este tempo livre todo". perguntei o porquê. a resposta: "andamos a aprender muitas coisas ao mesmo tempo, quase não temos tempo para descansar." numa outra sala, um outro aluno confessou que "aprendemos tantas coisas com a professora [titular] que ficamos baralhados. e não temos tempo para pôr tudo em ordem." falamos de alunos do 1º ano, do 1º ciclo, que já vão sentindo a pressão do tempo que não chega para tudo, dos TPC e de tudo aquilo que envolve o ambiente escolar. a minha tarefa é ingrata: estou com eles entre as 16h30 e as 17h30 e por isso, dentro do que é a filosofia para crianças, opto por metodologias o mais lúdicas possível. afinal, já dizia o Heraclito qualquer coisa como: o tempo é uma criança que brinca e joga. brincadeira de criança." que nunca nos falte o tempo para brincar. que nunca nos falte o tempo livre. boas festas, boas férias, bom descanso! a rádio miúdos mora na filosofia! É um espaço para perguntas e respostas, para cultivar o espanto e o porquê. Aqui a filosofia é trocada por e para miúdos! Um programa de Joana Rita Sousa. Terças e Sábados, às 4h00, às 12h30 e às 18h30. Onde? Aqui mesmo, na Rádio Miúdos! "podemos fazer um trabalho sobre o natal?" podemos, sim! claro que podemos. basta uma pergunta para "treinar" os exemplos e as justificações. "o que é um bom presente?" - foi este o pontapé de saída para uma reflexão sobre o natal. descobrimos que nem todos os presentes são coisas, que há razões diferentes para dizer que isto ou aquilo é um bom presente. e que por vezes presentes diferentes são bons, pela mesma razão. e para vocês, que estão aí desse lado - o que é um bom presente? podem dar um exemplo e explicar por que é que o consideram um bom presente? aproveitem para parar para pensar, a sós ou na companhia dos vossos filhos ou alunos. Peter Worley: ".(..) I think philosophy is inescapable if you’re human." I met Peter Worley on facebook. I think I was searching for new resources on #P4C and I found about one of his books: The If Machine. Peter was (well, is!) very nice to everyone who approachs him on social media and we started talking about P4C, resources, about how things are going on in the UK and Portugal. Peter is the president of SOPHIA and I joined as a member. Peter asked if I could help him finding out about a place to held the next SOPHIA member's meeting. We talked about it and - guess what? - the meeting will be held in Aveiro, Colégio D. José I, on July 2017. Right after ICPIC, in Madrid. And now, ladies and gentlemen, I give you The If Man aka Peter Worley. Peter, can you recall the first time you heard about philosophy for children (p4c)? "Because I had begun doing philosophy with children off my own back and with nothing other than my years of music teaching/counselling experience to help, my colleagues at the SPP (Society for Philosophy in Practice) put me in touch with their P4C practitioner. Through her, I found out about SAPERE and attended a Level 1 training course." How did you start working with p4c? "Before I had heard about p4c and Sapere, I was a guitar teacher in schools with an academic background in philosophy and an interest in philosophy outside of academe. After my first degree I trained with Tim LeBon to become a philosophical counsellor while completing an MA in philosophy. So, three things came together: music teaching, philosophy and counselling, and they led me naturally to think about doing philosophy with the children I worked with. At that time, I was unaware of a tradition of doing philosophy with children. The question is: is what I did then and do now P4C? I do philosophy with children (the phrase ‘philosophy with children’ is meant purely descriptively – it is not an acronym or a brand: I do X with F). Also, what I do when I do philosophy with children is not so different (though there are some differences) from what I do when I do philosophy with adults. So, I might prefer ‘P4X’. ‘X’ could be ‘children’, ‘teachers’, ‘adults’, ‘philosophers’ etc. Also, is it ‘P4C’ (for) or ‘PwC’ (with)? Is it ‘over’, ‘under’, ‘between’, ‘around’, ‘through’? Never really quite figured that one out (but looking at these, I quite like ‘between’ or ‘through’). I will be chairing a panel discussion at the next ICPIC conference in Madrid (2017) entitled ‘What does ‘P4C’ capture?’ with the aim of attempting to answer this question. Questions we might explore are: ‘Is p4c a referring term or a catch-all term?’, ‘Are there rules about who can use it?’, ‘Does it refer only to those within the Lipman tradition?’ and ‘If so, how close does one need to be to that tradition to be considered within it?’ When I write about what I do, I’ve taken to simply saying ‘philosophy with children’, ‘philosophy in schools’ and ‘philosophy in classrooms’. The particular approach that we at The Philosophy Foundation have developed we call ‘PhiE’, which simply stands for ‘philosophical enquiry’. But even then, if you run a PHiE, no philosophy is guaranteed. It is the hope. And with greater expertise from the facilitator, and with practice by the group and facilitator, the hope becomes more likely; and if not today then tomorrow. To find out more about PhiE go here: www.philosophy-foundation.org and here: https://kcl.academia.edu/PeteWorley"
Thanks, Peter. We shall check out your links. But tell me, do you think p4c is necessary for children? "Why? It depends what you mean by ‘necessary’. (A typical philosopher’s answer, I know!) If we mean a sine qua non then no, it’s not, children can get by in their education perfectly well without it. If, on the other hand we mean ‘necessary to achieve y’ then, maybe it is. And this depends on what we perceive the goals of education to be: functional or ideal? If education aims to produce functional citizens then there are many things that might be considered unnecessary: maths (beyond arithmetic), music, drama and maybe science among them (putting to one side specialisms). But if education aims to produce an ideal learner, a cognitive and moral agent, then you might say, as I do, that philosophy is necessary towards that end. Philosophical thinking is particularly well-placed to develop intellectual agency. How philosophy is to be implemented in education, whether p4c for instance is the right or only way to go, is another question." Nowadays children, at least at portuguese schools, have a lot of activities. Why should we take philosophy to schools? "Having said what I’ve just said, I do think that some strong cases can be made for doing philosophy in schools, without having to commit to its being necessary. A case can be made on the basis that it helps to develop reasoning, or more broadly, intellectual virtues, that it equips children to deal with incoherence, ambiguity, inconclusiveness, uncertainty. And whatever you think about philosophy being necessary for education, I think philosophy is inescapable if you’re human. Providing children with the language and methods to deal with something that they will, at some point, encounter could make a good case for an intervention such as philosophy. Prof. Michael Hand thinks that something like this is the case regarding political and moral aspects of civic life (that education informs). Philosophy is also a good antidote to the ‘pressure cooker’ environment the children find themselves in most of their school life. Having a ‘space to think’ may, for some, be considered a necessary part of any child’s school life, sufficient reason for its inclusion in education; but, I would caution: only if it remains a ‘space’ and doesn’t itself get sucked into the pressure cooker climate of testing and over-evaluation. As I mentioned briefly earlier, I also think that philosophy develops certain intellectual virtues and though philosophy is not unique in this, there is a case to be made for it being best placed to do this. The kinds of virtues I have in mind are: re-evaluation, judiciousness, developing a synoptic view, all of which develop metacognitive skills. In other words, philosophy is well-placed to develop a reflexive relationship between our ‘inner Socrates’ and our ‘inner slave boy’ (see Plato’s Meno). In effect, philosophy’s special ‘outside-of-itself-and-everything-else’ character helps to develop one’s own inner moral and cognitive ‘guide’. Could this be what Socrates meant by ‘his daimon’ in Plato’s Apology? However, I should point out that it is not a foregone conclusion what it is the guide should lead one to. In other words, I dispute the popular view that doing philosophy necessarily makes you a morally better person or that philosophy leads children to broadly liberal, communitarian values; philosophy is also subversive, iconoclastic and disruptive. I’m currently writing a piece on this for The Journal of Philosophy in Schools special issue on why we should teach philosophy in schools. So, keep an eye out for that!" I remember reading an article that you wrote about questions. Can you tell us what makes a question a philosophical question – from a p4c point of view? "Probably its openness. There is the openness of the question itself – it should be contestable, leading to controversies; and there is the openness of the philosopher – he or she should adopt what I call a position of defeasibility. (See here for more this: http://www.innovatemyschool.com/ideas/item/52-socratic-irony-in-the-classroom-clouseau-or-columbo?.html and http://www.ojs.unisa.edu.au/index.php/jps/article/view/1350 ) It should also get beyond first-order, surface considerations. For instance, ‘Who started the war?’ is not a philosophical question, but there are philosophical questions lurking very close by: e.g. ‘What is a war?’, ‘Under what circumstances would war be justified?’, ‘How can we decide what constitutes the cause of a war?’ Even these are only philosophical if they are treated in a philosophical way. For instance, ‘What is a war?’ might be answered by looking in a dictionary and, if the group feel that the matter is settled, then the question would not have been treated philosophically; but the fact that it still could be means that it has philosophical potential, even if it’s not been tapped yet by a particular group. But with regard to P4C (or philosophy with children), practically rather than theoretically speaking, I would say a good question is one that results in a philosophical conversation with the least amount of effort from the facilitator. Often the question needs to be linked to some kind of situation or other stimulus for contextualisation. For example, in the context of the situation of ‘the ship of Theseus’ (a ship that has all its parts replaced gradually over time) the question, ‘Is it the same ship?’ is perfect. I also think that (and this is not without exception, just a general observation) a good question is grammatically closed (where the answer is a one-word or short phrase answer) but conceptually open (it is contestable): e.g. ‘Is the mind the same as the brain?’ These kinds of question have the best of both worlds: the focus of a closed question but the elaboration of an open question." "There are several challenges: training, funding and resources, but in my view, the biggest challenge is maintaining quality. Making sure that philosophy is done when p4c is done, making sure that it doesn’t get over-simplified and done in the wrong way. Just to take a couple of examples: philosophy should not be used to explicitly lead children to desirable conclusions (particularly moral, political or religious ones), children should not be misled into thinking that ‘there are no right and wrong answers in philosophy’, and it should also not be hijacked for political ends, such as for sniffing out terrorists (the UK has a ‘Prevent’ agenda that p4c is being drawn into) or for promoting (for e.g.) ‘British values’ (another agenda p4c is being used for); to problematise them, yes, but not to blatantly promote them." Can you give the teachers and the parents some kind of advice to help them deal with the children’s questions? "Don’t focus too much on questions! I was in a Year 1 (ages 5 and 6 years) class the other day and we (the teacher and I) tried to run a standard p4c session with the book ‘Frog is Frightened’ by Max Veltjuis and when I asked them to come up with questions about the story the children didn’t know what a question was. (I did an exercise with them where I taught them what a question is and what a statement is and we sorted what they said into questions and statements and this worked very well). What we noticed was that the children became the most animated when one girl said, ‘Ghosts don’t exist’. Now, that’s not a question! So, we could either continue with the process of question-formulation, gathering and voting, or we could just ‘go with the children’. And that’s what we did. The point here is: 1) don’t worry too much about the procedure (be ready to jettison any procedure at any time) and 2) don’t worry too much about questions; statements can be just as – if not more – effective at provoking discussion. And actually, very young children are more likely to respond with statements than questions. This is not a problem though; just go with it. I call it the ‘Quote. Discuss.’ strategy; a common ‘question’ approach for degree and higher exams that works just as well with younger students. I also like tasks such as ‘Do nothing’ or ‘Think of nothing’ or ‘Draw a round square’, or ‘Do a deliberate mistake’. So, it’s not always about questions. 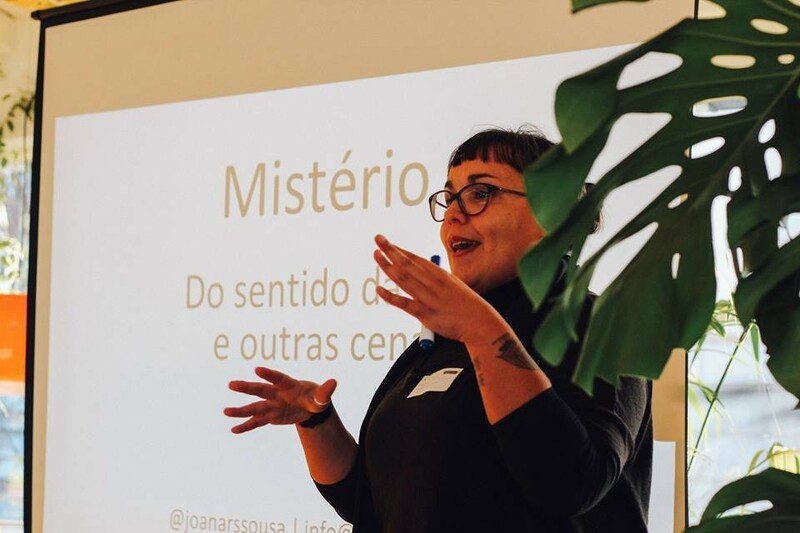 The next SOPHIA meeting, here in Portugal, will be entitled ‘Questioning questioning’ and we will be looking in some depth at this and many other related aspects of questions and questioning in the facilitation of philosophical conversations. So, do come along!" Did the children ever surprise you with a question? Can you share that question with us? "Yes: ‘Do you paint your hair grey!’ and ‘Have you had medical difficulties this week, Mr. Worley?’ But if you mean philosophical questions, then, ‘yes’ to that too. One that sticks in my mind is when we had pretty much finished the session and I had been ‘boarding’ a good deal during the session (I don’t always do this) and one very philosophical boy put his hand up and said (while pointing to the board), ‘Mr. Worley, we’ve heard all these ideas today but how are going to decide which one’s right?’ I think this is one of the most profound questions I’ve heard (interestingly, not a voted-on enquiry question; just one that came up spontaneously – my favourite kind, by the way). His question reminds us that philosophy is not just a sharing forum, it has an evaluative aspect that is sometimes forgotten. Philosophy doesn’t just explore, it has to move to an eliminative, evaluative stage too. Good questions we (philosophy facilitators of whatever school) should all ask ourselves are: how often do my philosophy sessions move beyond simply sharing and exploring? And how do I/we move to meta-analyses in the classroom? And how do I/we move to the elimination and evaluation of ideas? Though there are ways to do this, it is not easy and I’m never satisfied that I or the p4c community has properly answered his question. I’d love to hear from anyone who thinks they have!" See you in Madrid and then Aveiro! 2017 marca o regresso dos encontros SOPHIA ao nosso país.